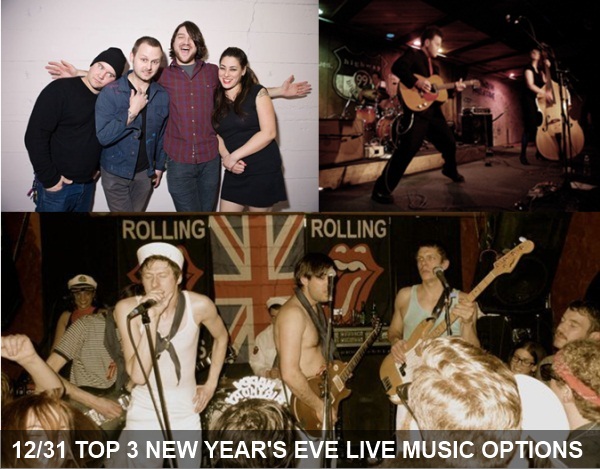 If you’re looking to start your 2012 off with some great live music, we hope this list will be your last minute savior. While house parties and/or open bar situations sound tempting before the fact, we’ll bet you’ll be better served by taking in some great Seattle bands with a celebratory drink in hand. As an added bonus, all three of these options come with bargain-basement prices and are, as of posting, not yet sold out. Look for us at one or more of the following venues, as we can’t decide ourselves where music-loving Seattleites will have the most fun. If your definition of a great NYE contains some variant of the words fun and nostalgia, you’d be hard pressed to find a better match than seeing some of Seattle’s best musicians tackling the work of Richards and Jagger. With representatives from Seattle bands Past Lives, The Blood Brothers, Flexions, Shoplifting, Truckasaurus and Whalebones, expect a night of supreme fun and unparalleled musicianship. While Joel Schneider may be best known as one-half of the muscularly dexterous, critically-acclaimed Seattle duo My Goodness, his other band Absolute Monarchs has been picking up considerable accolades and a label (Seattle Rock Guy’s Good to Die Records) in 2011 as well. This show, which also features Deadkill and Cold Cold Ground, is by far the heaviest of the three recommendations. If rockabilly’s more your speed, head on down to Slim’s Last Chance to see some of the liveliest purveyors of retro roots rock you’ve likely heard all year. The bill also features Marshall Scott Warner, Rachel Lynn Harrington & the Knockouts, Roy Kay Trio, The 1uppers. If your month’s been at all like ours, and we imagine it certainly has, December’s been overwhelmingly jam-packed well before you even thought about flipping over your calendar. While we can’t grant you gift of tranquility, though in this season of Festival yelling out Serenity Now! might not be our worst suggestion, we can attempt to ease your load of stress, year-end obligations and shopping with a recommendation of great live tunes. Tomorrow night’s recommended band are a group Northern neighbors who happen to play some of the finest Canyon Rock that’s hit our ears for years. 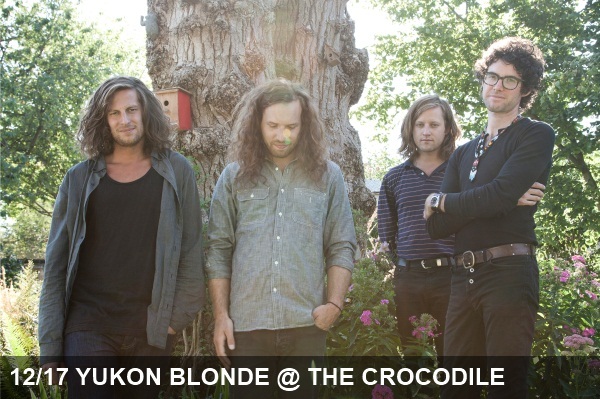 We were lucky enough to catch up with Vancouver’s Yukon Blonde in advance of their gig opening for the Fling this Saturday at the The Croc. Be sure to check out their excellent, yet heart-breaking video for “Water” below, scroll through our interview with bassist John Jeffrey and head over to your favorite, least-sketchy Belltown haunt tomorrow to take in the live experience for yourself. We often hear a lot about the Portland and Seattle scene, for obvious reasons but are far less familiar with what’s going on up in Vancouver. How would you describe the scene and who are three bands our readers should check out right now… err..after finishing reading this interview? Vancouver is good. Unfortunately we don’t know as much about it as we should. We’ve been on tour so much our visits there have been few and far between. Our favorite bands from there, who are definitely worth checking out, are Dan Mangan, Black Mountain, Ladyhawk, Brasstronaut, Hannah Georgas, Sun Wizard, Chains of Love, Library.. Sorry that’s more than three but it’s hard to narrow it down. Is there a usual process, or maybe even a few processes, that an idea goes from being just that to becoming part of a song? Most of the time Jeff will present us with ideas, whether it’s just a section or an entire song and we’ll hash it out as a group. Jeff’s the architect and we’re the contractors. How did you first meet up with The Fling and how’s the current tour going so far? to listen to them. It’s humbling to watch such a good band every night and they’re just as good people as they are musicians. It’s been great. If you lived in an alternate reality where you forced to play the catalog of another musician/band for an entire year, which musicians or band’s works would you play? Well, I can’t speak for the other guys, but if I were to be in an alternate reality I’d love to play another instrument in an improvised setting for a while. It would be amazing to play some music, or attempt to, of the obvious improvisational greats Miles Davis, Coltrane, Charles Mingus, Thelonious Monk, Ornette Coleman etc. Any Seattle musicians or bands that you’re particularly enjoying at the moment? Fleet Foxes are great obviously; I watched The Head and the Heart in Vancouver a while ago and thought they were awesome. What’s next for you and the band through the end of the year and beyond? Well, we have a few more dates left in the States and then we’re lucky enough to go to Australia to play a handful of shows. We’ll be bringing in the New Year in Brisbane! As we’ve said many times before, we’re big fans of music-for-a-cause type situations. When causes we believe in join forces with bands whose tunes hit our ears favorably, more often than not, we’re going to recommend that show to you as well. As the headline gives away already, tonight’s one of those nights. Team Up For Nonprofits, an up-and-coming group that raises much-needed funds for other local non-profits through the intersection of music and socializing (whether in-person events or of the virtual variety), is bringing two very talented acts from Washington, Ravenna Woods‘ Chris Cunningham and Lower Lights Burning (based in Seattle and Shelton, respectively), and one lively headlining act from Portland, Drew Grow and The Pastor’s Wives, together for a benefit at the Tractor tonight. We wholeheartedly recommend getting there by 8 p.m. as the act we’re most excited about seeing is set to take the stage on the hour. Chris Cunningham of Ravenna Woods is not only the frontman of Seattle’s best percussive-acoustic trio, he’s one of the city’s musicians with the best senses of humor, which he’ll no doubt exhibit during his between-song banter. For Chris’ musical contribution to the evening expect a sample of Ravenna Woods’ trademarked take on beautifully controlled chaos, featuring unexpected syncopation and meticulously crafted lyrics. As aging die-hard music fans, we’re always up for a great show but we definitely appreciate when the bands we want to see most go on well before midnight. As luck has it, tonight is one of those nights when the bands we’re most excited about are actually are either supporting or opening. Sure, their sets will be shorter set than you’d choose and there’s a higher chance of annoyingly loud bar chatter interfering with your listening experience but something tells us none of that will matter tonight. These two high-energy, young acts from Seattle are sure to captivate the crowds with their own brand of cheeky electronic-pop and blues-infused garage rock, respectively. As we often say, there’s an overabundance of great live music options in Seattle. And we mean that in the best way possible. To help you prioritize what shows are the most worthy of your attention, we look through the calendars of our favorite venues and those of a few local listings sites to pick out the Hope Diamonds in the group amongst a usual pile of gems. With a handful of great shows in the next 72 hours, this weekend is not-surprisingly no exception. Read on for our top picks. Folk overload at the Columbia City Theater! The Seattle Folk Festival boasts an impressive line-up including Bryan John Appleby, Riley Baugus, Pharis & Jason Romero, Sean Flinn & The Royal We, Brother Bear, Ben Fisher, Alina Hardin, Annie Ford & Greg Paul, Youth Rescue Mission, and more more more! Check out the online mix the fine festival folks have put together for your listening pleasure below. The festival goes from 12/9 through 12/11 in venues across the city. Full details at http://www.seattlefolkfestival.com/. Our favorite ambitious ambient folk acts on an epic and stripped-down scale, respectively, Other Lives and JBM play the Tractor. As we’re always up for “music for a cause” type situations, tonight’s event at Chop Suey has been on our radar for a while now. 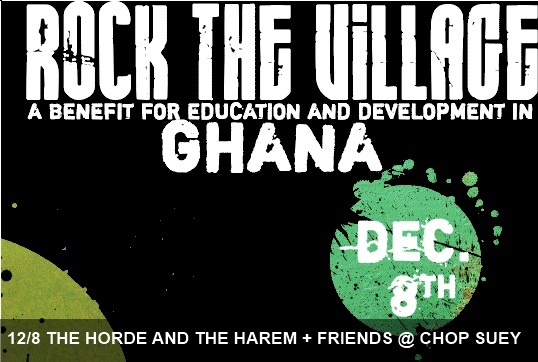 “Rock the Village: A Benefit for Education and Development in Ghana” brings together some of the best folk-loving, harmony-heavy groups playing Seattle today for a great cause. The night will kick off with roots folk from The Washover Fans before last year’s EMP Sound Off Runners-Up Northern Departure light up the dragon-filled venue with their fast-picking take on NW bluegrass. Lastly, The Horde and the Harem will kick things up a notch or two with their impassioned, rustic-leaning folk with modern rock flourishes and subtle appreciation of The Arcade Fire. The event starts at 8 p.m. Tickets are $10 at the door. provides small, low interest loans to emerging entrepreneurs in three small villages in Ghana. These entrepreneurs often have no other access to loans with which they can start a business. 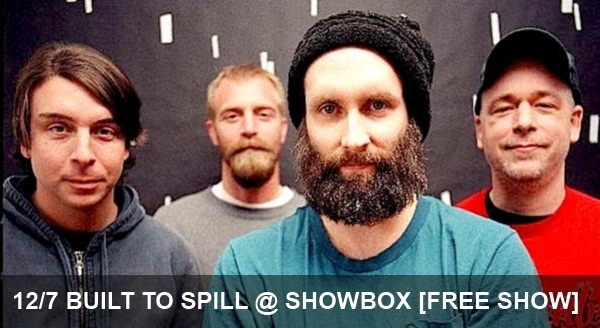 In our opinion, Built to Spill is one of the absolute best bands the Pacific Northwest has ever produced. Doug Martsch’s obscure lyrical wit, boyish vocals, “guitar god” status and mysterious public persona makes us smile on a daily basis. When we’re not listening to BTS or his excellent, slide-guitar heavy one and only solo album, we’re wishing we could be listening to him live. Well, actually those to activities usually overlap quite a bit, as you might expect. Oh yeah…And it’s FREE! Head to the Showbox tonight for all live experience. But first, be sure to head over to the event’s eventbrite page to RSVP for the free tickets as part of Rhapsody’s 10th Anniversary Blow-Out! Doors at 8 p.m. In need of a musical pick-me-up this evening? 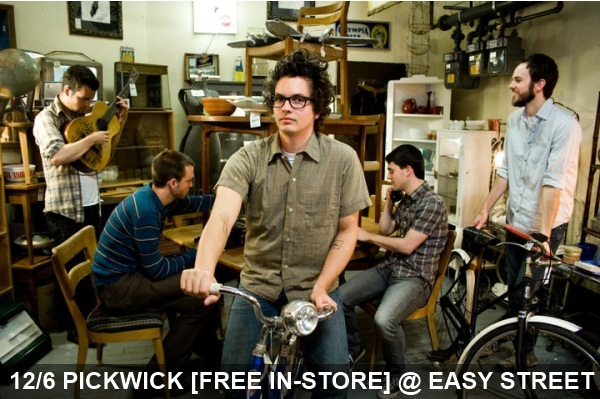 Pickwick, Seattle’s favorite indie-pop-meets-soul group, will be swinging by Easy Street Records in Lower Queen Anne for an in-store set tonight. The set starts at 7:00 PM, but make sure you’re there early as this is sure to be a(n extremely) crowded event… just like most of Easy Street’s fantastic in-store events. The band will also be playing a gig with another local favorite Campfire OK at the Neptune on Thursday. That show’s been sold out for a while, so tonight’s your best chance to hear Galen Disston’s smooth vocals in person without having to spend every waking minute refreshing Craigslist with your fingers crossed. Not only should you come for some great tunes, but this is also a great opportunity to pick up a few gifts for the music lovers in your life. After seeing the excellent Someone Still Loves you Boris Yeltsin at the Tractor this past weekend, we’ve once again become infatuated with singing drummers. As luck has it, Seattle’s best frontman drummer and one of it’s finest pop lyricists (and fittingly, an alcohol-supplying friend of SSLYBY), Michael Lerner will be bringing his Pavement-inspired and Death Cab-esque pop rock gems to The Crocodile tonight. 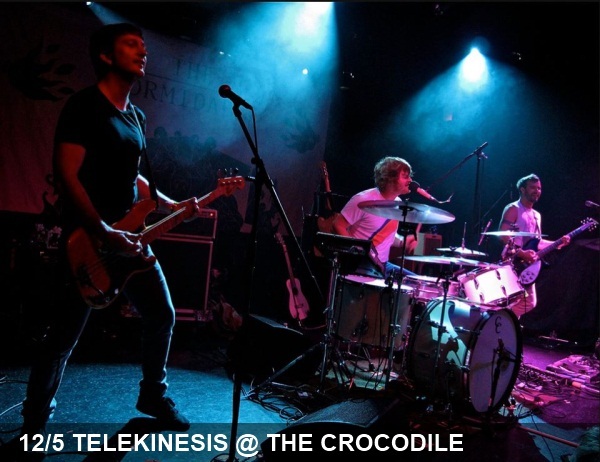 His band Telekinesis will headline the evening that also features Seattle’s Young Evils and NYC’s Caveman. Some groups have careers that seem fleeting; an album release or two, and then the band is kaput. But a few great bands have the staying power to someday celebrate a decade of music-making. One such group will be celebrating their ten year anniversary next year. 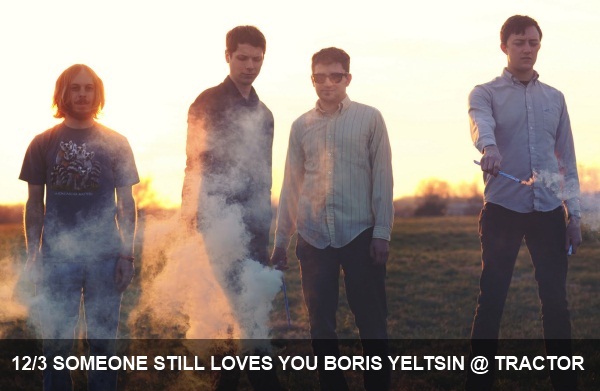 Someone Still Loves You Boris Yeltsin, a quartet hailing from Springfield, MO, has stayed relatively under the radar while releasing four studio albums and playing venues across the nation. With an utterly charming blend of indie folk and rock, SSLYBY has captured the hearts of many and we’re so glad they are back in Seattle tonight. Don’t miss their show tonight at the Tractor Tavern, with Ha Ha Tonka and Black Whales.